What Does JOYFUL LEARNING Look Like? Excitement abounds when your child eagerly rocks back and forth and loudly sings “The More We Get Together” perfectly echoes the teacher’s singing and movements, or when he proudly plays the drum in front of all the other children when it’s his turn. I ask you, “Can there be any better confirmation that our children are having fun, learning, and loving music class? !” BUT, does joyful learning always have to look like this? My son, Breck, loves to stay close to me during his WeJoySing class, mostly sitting in my lap and prefers to be held during most standing activities. This is especially true when he’s in a large group! He hides his eyes when it’s his turn to say his name during “The More We Get Together,” and he’s not interested in playing his drum on command when it’s his turn. He often quietly but intensely watches his teacher, Mrs. Lynnette, instead of playing the instrument in his hands. I have wondered: is he “getting anything” out of class; is he having fun; what is he learning when he isn’t “actively participating” during class? A significant portion of my life as an elementary school educator has been spent studying child development. However, I realized that despite what I KNOW to be true about children and the way they learn, I wasn’t acknowledging the fact that each one of us, including my son, has a wonderfully unique learning style. Some people learn better by watching, some by listening, some by doing. We all have different strengths and types of intelligence that impact the way we learn. These components, combined with our personality and temperament, make up the way that we learn best. I needed to consider my son’s learning style and personality when thinking about his experiences in WeJoySing. At home with his Dad and me he is downright enthusiastic, energetic but, is much more reserved in larger groups and in public places. He becomes more cautious, careful, and hesitant. I needed to realize this wasn’t a flaw or something to be worried about, but a special part of his personality that I needed to nurture and BE COMFORTABLE with, instead of feeling the need to force him into active participation. That would come when and if HE was comfortable with it. With this new perspective my view of Breck’s WeJoySing experiences began to change. I began to recognize and identify ways in which he has LEARNED, GROWN, and expressed JOY. Despite his seemingly disinterest in having a drum “solo” during class, he will pull out his own drum at home and play the steady beat, singing and humming to himself while he drums. His class time is spent processing all this information!! Amazing!! Only 12 months ago he would sob when he had to return his instruments. Now he eagerly walks over to Mrs. Lynette, waits patiently in line with his ready hands, and smiles proudly as he returns to me. 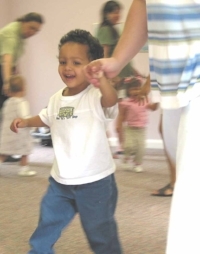 Although he is shy when in a larger group, at home he dances, sings, and plays instruments as I practice the songs for my own WeJoySing classes. Although he doesn’t always want to play during class, he finds his bells at home and yells “horse” until I sing “Bell Horses” with him. He even eagerly hides the bells behind is back at the end! Although he doesn’t raise his hands up and perform the motions to the apple tree song, he will shout out his favorite color “PURP!” (purple) when Mrs. Lynnette asks what color the apples should be. Joy doesn’t look the same for all kids. Participation doesn’t look the same for all kids. Learning doesn’t look the same for all kids. And praise God, they are not all the same! Each of our children has a unique way of learning and expressing themselves. How special is that? It’s our privilege and responsibility as parents to CELEBRATE our children just the way they are. We can nurture our children’s sense of comfort and participation by continuing to model our enthusiasm for music, by fully engaging with our children even when they don’t seem to be responding, and by celebrating their efforts in all circumstances (even when it looks like non-participation). Breck is not the kid who “looks” like he is having the time of his life, imitating everything the teacher does during class. He is not the one who eagerly participates in every activity. But when I take the time to think about all the ways he has grown throughout his time in WeJoySing, it becomes clear that he IS LEARNING and that he LOVES music. My son is not only developing musical skills while in WeJoySing, but he is learning the incredibly important skills of how to listen, how to wait patiently, and how to celebrate another child’s turn. Breck is developing important fine and gross motor skills, building his vocabulary, and enhancing his verbal abilities. He is making mind-body connections in ways that only music can facilitate. He is developing relationships with his teacher and other students, and forging an even stronger bond with me, his mom, through this shared experience. 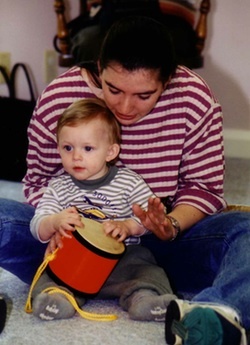 I love teaching WeJoySing, but even more than that, I love sharing in the JOY of WeJoySing with my son. And I love doing it HIS WAY. Joyfully to YOU our WeJoySing Family!